While it is amazing that Nintendo’s Mario Kart series has been around since 1992, it’s not surprising given its winning-if-retread nature: race, battle, repeat. Over the course of two-plus decades, most times we’ve gotten the game we get. “Mario Kart 8” is the game we deserve. It is easily the best entry in the 22-year-old franchise. Between stunning high-definition vistas, series-upending special items, and next-generation online play additions and refinements, it ups the ante for fun and interactivity on the Wii U.
Nintendo set the standard with “Super Mario Kart” on the Super Nintendo Entertainment System. While racing games were well entrenched on home consoles by the early ‘90s, the addition of recognizable-yet-enhancing power-ups elevated the genre to a new level. Most innovative, however, was the battle mode which allowed players to face one another with those items in an arena setting and quickly became a defining staple of the series, not to mention the source of many dust-ups in front of the TV in dens and college dorm rooms everywhere. 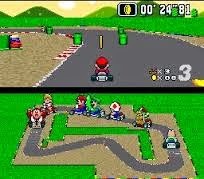 "Super Mario Kart" led to many multiplayer pile-ups. “Mario Kart 8” is mostly much of the same, carrying over many of the great features and going to lengths not yet reached. The grand prix mode is an all-star grouping of original and returning tracks from previous versions. The battle mode gets the blood pumping and spilling as players careen around courses in a quest to pop each other’s three balloons. While the courses are bright (Sunshine Airport) and lush (Dolphin Shoals) in HD, there’s been a critical change to the battle mode. No longer do players inhabit the far-preferable arena setting, but are now thrust into a race track to battle, something that tends to overwhelm the senses in what was already a pulse-pounding pastime. Having to drive a course and avoid obstacles while attempting to stalk opponents is simultaneously exciting and frustrating. "Mario Kart 8" multiplayer battles are intense and irritating. 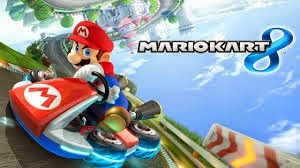 The ability to unlock add-ons to customize karts with body frames, wheels and gliders as well as characters old and new deepens the playability of this outing. “Mario Kart Wii” allowed gamers to utilize that system’s unique motion control by incorporating the Wii-mote controller into an included steering wheel accessory. “Mario Kart 8” allows for the use of that peripheral or the WiiU gamepad with enhanced interaction. The controls can be set to regular with the joystick or motion control where players use the gamepad like a steering wheel. While I prefer the joystick, the motion control is a thoughtful and welcome carry-over. 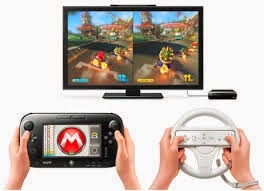 "Mario Kart 8" players can use the gamepad and steering wheel. Where “Mario Kart 8” separates itself from previous incarnations is in its special items. While all the favorites are back (speed-up mushrooms, slippery bananas) as well as some not-so-favorites (the visibility-limiting, ink-shooting blooper squid), the nuclear option had long been the opponent-seeking red turtle shells. There is now a nuclear deterrent in the super horn, which can ward off those nearly-undodgeable red shells in addition to being used as a proximity weapon itself. It is a bold addition on top of the boomerang flower, potted piranha plant and kitchen sink-esque Crazy Eight, which gives a player a revolving arsenal of eight items. The super horn honks its own horn. Hitting yourself with a ricocheting green shell has always been an art, but the cheepness, er, cheapness of the red shells has finally been balanced out. It just would have been nice to see the new item play itself out in the arena setting as opposed to the race track. The inclusion of a highlight reel after each race or battle adds to the HD spectacle. 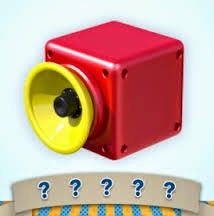 Players can relive races or rounds in normal speed or slow motion, forward or reverse. A highlight can even be edited and shared online. Online, though, is where the gravity-defying “Mario Kart 8” soars. 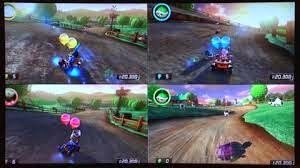 Not only can players earn stamps and post messages to the Miiverse, they can race and battle each other from all over the world for bragging rights and points. While this is not a new feature -- “Mario Kart Wii” went there first -- “Mario Kart 8” makes the most of this mode, allowing for worldwide, regional, friend-only or customizable tournaments. It’s online where unlocked characters, karts and add-ons become worth their weight in gold coins. I didn’t finish last in my first foray onto the Nintendo Network, but building up unlockables made it much easier to finish in the money. Exchanging online taunts before and after battles is fun too and makes playing multiplayer Mario Kart much safer than the past in a physical sense. 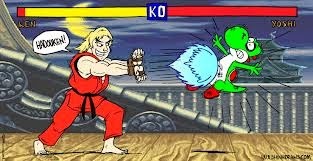 How do you feel about Ken's who say "Hadouken! "?